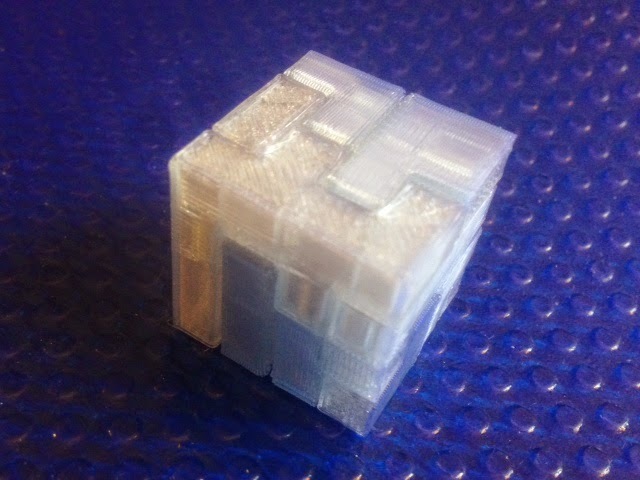 A few days ago we printed richgain's Printable Interlocking Puzzle #1, and today our print is his Printable Interlocking Puzzle #2. For me this was actually a pretty difficult puzzle to put together. However the pieces fit together very well with good clearances; nothing needs to be forced. The model looks nice even when all the pieces are printed in the same color, because with translucent filament the pieces have different looks and finishes from different viewpoints. This is a very clean model, and nice enough to give as a gift. Settings: We printed these on a Replicator 2 with .2mm layer height, as recommended in the instructions for the model.